IKRUSH Womens Roselle Long Over Coat. Glam or what?! This gorgeous Kardashian inspired over coat is the perfect addition to a party look. Put this over a stylish pair of skinny jeans and throw on a pair of heels and you're ready to go! Polyester/EstalaneApprox. IKRUSH Womens Paola Mesh Long Sleeved Top. IKRUSH Womens Lysa Long Over Coat. 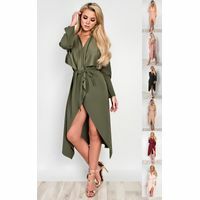 IKRUSH Womens Goya Long Belted Coat. IKRUSH Womens Karmen Bardot Stretch Long Sleeved Frill Crop Top. IKRUSH Womens Camilla Bardot Lace Up Long Sleeve Crop Top. iKrush Jayla Tie Longline Kaftan Cover Up. iKrush Mela Long Sleeve Cut Out Bodycon Dress.